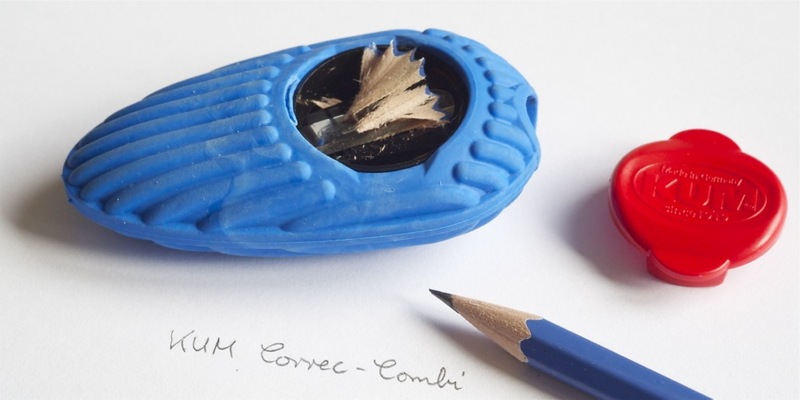 Today I want to show you KUM’s Correc-Combi, a sharpener in an eraser case, which I bought this April for €2.79 (~$3.65; £2.25) in Müller in Volkach, Germany. The blade of the sharpener is fixed to a plastic body which in turn is encase by (quite a large) eraser. I am sure it will take quite a long time to use this eraser up. The performance of the sharpener is quite good, certainly much better than the performance of KUM’s 400-1K. 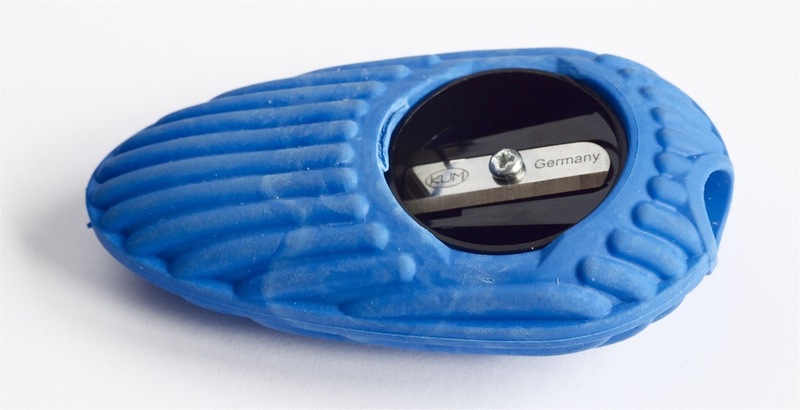 The sharpener produces thin shavings with an average thickness of 0.2 mm1. I also saw a set square from Globus by KUM for 49c (~ 65¢; 40p) in the same shop and couldn’t resist buying it. You might remember the list of sharpening angles of the different sharpeners in the KUM 400-1K blog post. 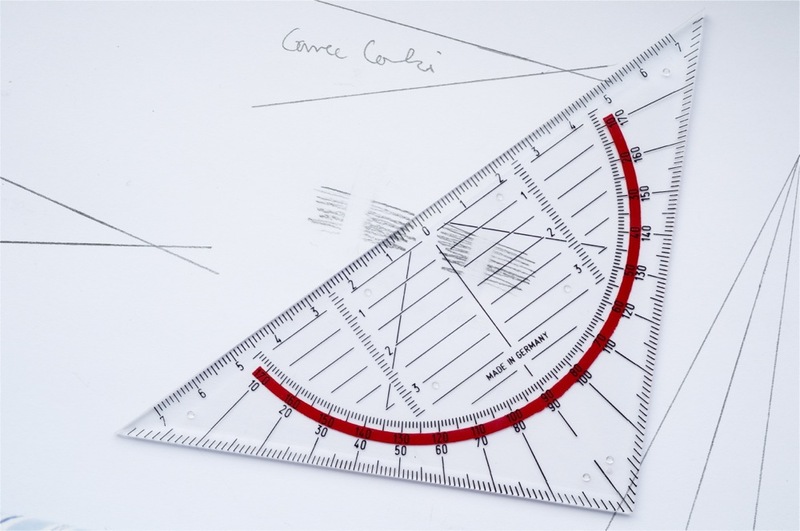 When I figured these angles out, two years ago, I didn’t have a set square – so this time figuring the angle out was much easier. With about 22° the sharpening angle of the KUM Correc-Combi is very similar to the sharpening angle of Möbius+Ruppert’s grenade. A very good sharpener/eraser combination. The lid fits well, despite being a ‘click in’ lid (no screw thread) . 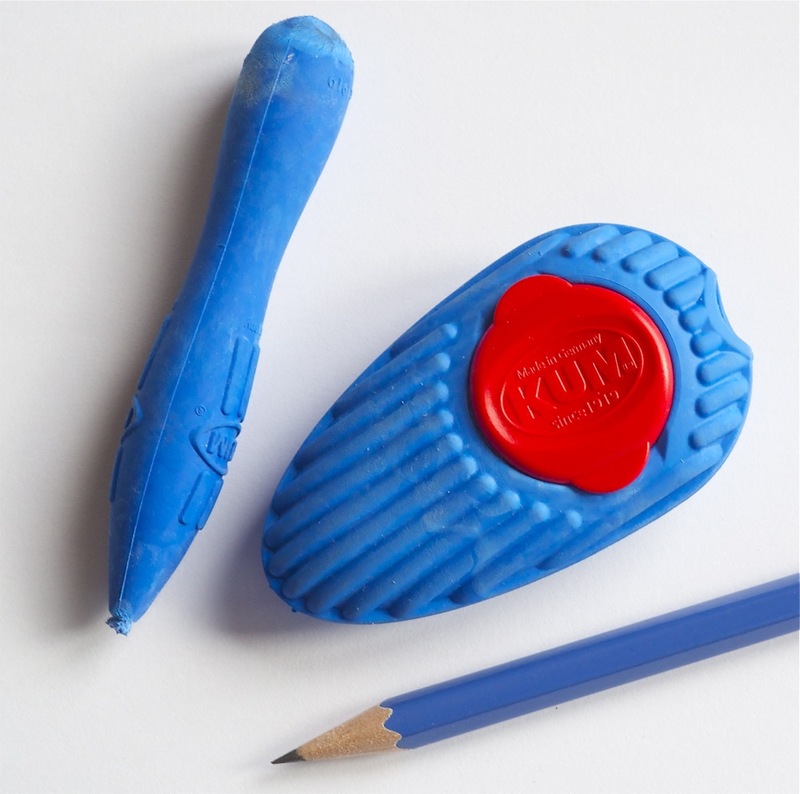 The performance of the eraser is similar to that of KUM’s Correc Stick. It could be better, but is by no means bad. The performance of the sharpener is quite good and overall this eraser/sharpener combo offers very good value for money. I would like to thank Hen Chung from RAH for the Staedtler norica 132 46 HB you can see on the photos. It’s the less purple version with blind stamped “SRP”2. The Correc-Combi is part of KUM’s Blue Ocean series. You can read a review of KUM’s Blue Ocean pencil set at pencil talk. You can also read a review of Staedtler’s norica at pencil talk. In a previous blog post I wrote about Faber-Castell’s sharpener-eraser pen. Looks very nice, Matthias…at least whilst new. The way I dirty my erasers, I can imagine a less appealing sight after a few days/weeks use. The Faber Castell model, I have commented on somewhere previously and I have to say I don’t like it. I am a traditional rectangular eraser kind a guy and I don’t really understand these curved designs..even my tombow mono zero stick eraser (which I lost 2 days ago under a big tree while sketching) is/was rectangular, albeit, in a very small form factor. Nice colours though. Thank you for this detailed review. To me, this item is quite odd, although not half as odd as the new eraser/brush combination I came across recently. I am surprised about your positive rating of the eraser – the last KUM erasers I have tried were rather poor (at least in my opinion). Does the Correc-Combi say where it has been made? Gunther, I should look for this eraser/brush combination. I only know Staedtler’s, and I think you once showed one that has been assembled in a prison. I am not sure I remember the details, maybe that was a brush without an eraser. The performance of the eraser isn’t great. I’ve seen better, but I’ve definitely also seen worse. If it was just an eraser I wouldn’t get too excited, my favourites are still “dust free” erasers, but as a sharpener/eraser combo it’s quite good, and the sharpener is better than some of my other KUM sharpeners. According to the red lid the Correc-Combi is made in Germany. I assume this applies to both, the sharpener and the eraser, but I cannot be 100% sure. I should have been more precise – the KUM combination is a paintbrush in a thin metal tube with a Correc Stick as its handle (it’s different from the clever combination of eraser and cleaning brush made in a workshop for the handicapped; see here). The brush/Correc Stick combination sounds odd. It might make sense when using it together with coloured aquarelle pencils, but the Correc Stick seems to be too rough an eraser for this kind of work. Thanks for the link to the eraser and cleaning brush. I don’t know why I thought it was made in a prison. I might have mixed it up with some other stationery I saw somewhere else. It is odd 😉 (Unfortunately – or should I say luckily? – I don’t have a photo.) I don’t know why they came up with that product but I can’t help thinking that this is a solution looking for a problem. To make matters worse the quality of the paintbrush is quite low. Interesting sharpener design. Though I can see capping the lid becoming a chore for those frequent sharpeners. 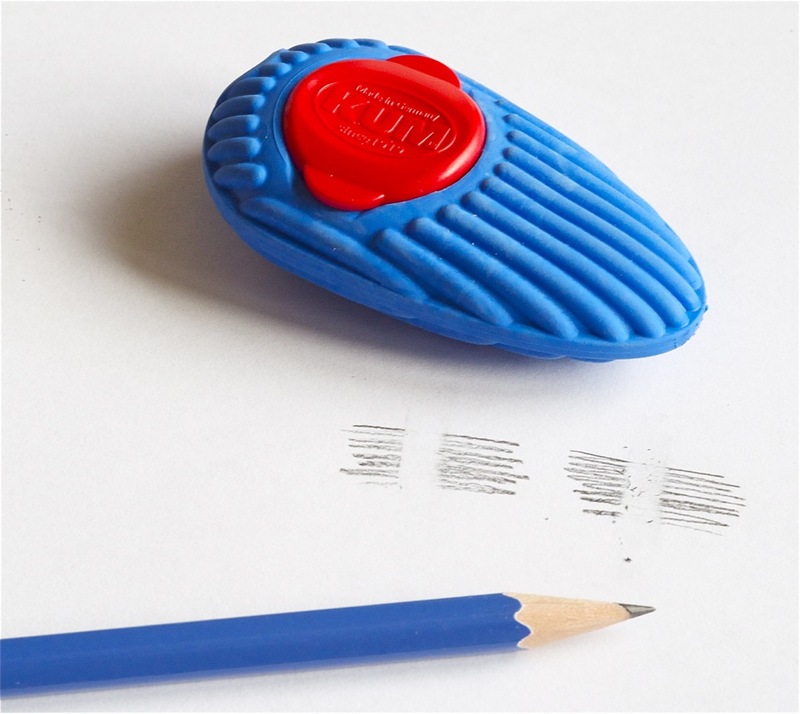 The brush-eraser combo looks very interesting, though the brush looks quite hard. Like Matthias, I prefer erasers that don’t shed to start with. Claire, in the case of the eraser/brush combination the eraser is quite firm and produces only very few dust, and the brush is not very hard. Thanks for the information Gunther!